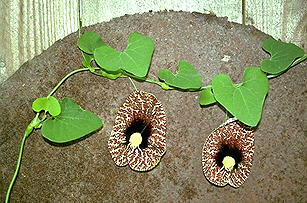 This Calico Flower or Dutchman's Pipe as some Aristolochia species are known, comes from Brazil. In southern California it is an evergreen vine that typically can grow to 5-8 feet tall or higher with support. The attractive leaves are heart shaped and scattered along the twinning stem. This plant has very unusual flowers which appear from summer to fall; the white buds have dark veining, looking a bit like small inflated lungs which upon splitting longitudinally, reveal the flower, which are a deep brownish purple blotched with cream. Plant in light shade or full sun along the coast. Evergreen and hardy to 25 degrees F and root hardy to below 20 degrees F. Give moderate to abundant water.